Photo Courtesy of Farm Aid. Photo by Paul Natkin/Photo Reserve Inc.
Farm Aid began in 1985 as a concert by professional musicians to raise money for poor and needy small farm families. Since then, Farm Aid concerts have become yearly events. So far over 15 million dollars have been raised and distributed to farm organizations, churches, and service agencies to help struggling family farmers. 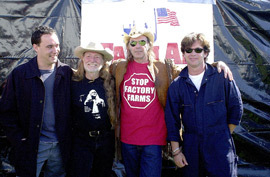 Although the performers vary somewhat each year, singer-songwriters Willie Nelson, John Mellencamp, and Neil Young serve on the board of directors for Farm Aid and have performed at every Farm Aid concert. In addition to the 23,000 concertgoers at the 2000 concert, millions of Americans across the country watched the concert on television and called special telephone numbers to donate money to Farm Aid. Farm Aid also runs an information program on its activities and the plight of small farmers on its website.